The Trump Tower, 68 floors of elegant steel shooting up into New York’s skyline on 57th Street and Fifth Avenue, and the Pitchat Shalom region in the western section of the Negev accelerating development of the Donald J. Trump Project — thousands of miles and lifestyles apart — but joined together irrevocably by a 38-year-old business whiz name Donald J. Trump, who was honored by Jewish National Fund’s Tree of Life Award. The affair was the most successful of JNF’s history and one of the most fabulous that we have covered. The scene, The Grand Hyatt Hotel, on 42nd and Lexington Avenue renovated into modernity by Trump a few short years ago. The grand ballroom sported a replica of the New York Horizon skyline featuring the Trump Tower outlined in glowing light bulbs a la Broadway theatres. The decor in black and white for dramatic beauty where even each chair was fitted with a white-back slip covering; where each black table cloth had white napkins in fan shape splendor encased in a lucite napkin holder, each black flower vase sprayed two dozen white long-stemmed roses and each guest received a white carnation in plastic green holder for dress or jacket. Entertainment was continuous by The L’CIique Players — mimes and assorted acts in costumes from a Hollywood version of “Over The Rainbow,” a full band and entertainers with a Liza Minnelli lookalike and soundalike. At the reception, I greeted George Klein, Republican national Jewish liaison leader and real estate industrialist; Dr. Mordecai HaCohen, a top executive of Bank Leumi who was introducing the new president of the bank in the U.S., Israeli David Novick. The Hon. Jerome Becker, who recently resigned as a New York City Criminal Court Judge, quite active on the Jewish scene and on JNF’s N.Y. board along with Roy Cohen, another prominent attorney who wore a gray tuxedo among the many black tuxes. Former Governor Hugh L. Carey, pounds lighter since leaving as head of New York State, with luscious wife Evangeline Goulelas Carey, who looked regal in a long black velvet gown outlined in gold braiding, which also in a lighter version was threaded through her hair braid. The Carey’s were the dinnermates of the Leonard Goldensons, ABC-TV president who has just retired. Both couples, guests of Donald Trump, he told all. Gov. Cuomo’s newest appointee, Dr. Israel Mowshowitz, liaison to the Jewish community, delivered greetings from Gov. Cuomo and also gave the invocation. Mowshowitz is now rabbi emeritus of the Hillcrest Jewish Center. Hank Sopher, JNF N.Y. Region head was dinner co-chairman, sharing the introductory honors with Ben Holloway, a close friend of the Trump family. 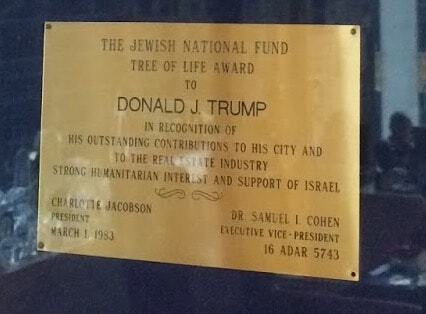 Donald Trump, appearing even years younger than 38, with a boyish grin, told the 1,500 guests that he accepted the JNF bid to honor him — noting that there had been numerous requests rejected from many notable organizations “because a dear friend, Bunny Lindenbaum, who passed on several years ago was such a strong supporter and taught us what the initials JNF has meant in the growth of Israel. …” (Lindenbaum was a prominent attorney involved in real estate, a Brooklyn resident, lifetime member of the Brooklyn Jewish Center. A number of his family and law associates were present ‘sheping nachus’ . Dr. I. Cohen, JNF executive, represented the group, as President Charlotte Jacobson was in Israel where the JNF was holding its annual meeting. Dr. Cohen explained about the Donald Trump project in Pitchat Shalom named in honor of this young man who heads one of the top, if not the top real estate developing firms in the USA. For his dedication and commitment, JNF is naming its project in Pitchat Shalom for him. Located less than ten kilometers from the newly-created border with Egypt, it was created to provide those settlers relocating from the Sinai with homes, industry and security. Donald Trump had his wife, sister, brother, parents (Fred Trump who built thousands of Brooklyn homes over 40 years ago where Jews were the principal buyers) stand up for recognition. Of the 150 tables of ten, headed by leaders of many of the industries doing business with Trump, or associates in the building empire, or friends of JNF, we found our seat at the Rapid American Corporation table, a firm that is headed by Israeli-born Meshulani Riklis, who was not present although his parents Pinchus and Batya Riklis were.